Car Windshield Repair Kit is designed for small damages. Should only be used on bulls-eye, spider web, star damages, and some combination breaks smaller than 1 inch (25 mm) in diameter. This kit will not repair surface pits larger than or cracks longer than 8 inch (20cm). 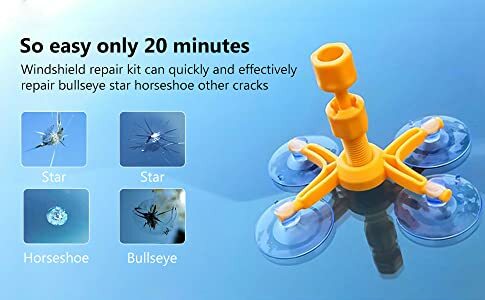 Easy to use windshield crack repair set, windshield repair kit can quickly and effectively repair small cracks, bullseye, star horseshoe and so on only in 20 minutes. Advanced resin formula, good for multiple repairs, fit with all types of laminated windshields. The air in the crack will block the infiltration of the repair fluid, and our windshield repair kit have vacuum function to quickly remove air from the crack. Imported repair fluid (this is the key), the shear strength can reach to 20PA, the repair location will not be broken even though glass break. And can prevent small cracks from spreading. Enhanced injection plastic injection molding head, can produce a strong pressure to push the repair liquid into cracks. At first glance, match the description. Delivery 3-4 weeks. looks good but still didn't use it. after using it I will write my opinion.